Fabrics with various patterns and colors for your vertical blinds. The esthetic qualities of Dickson® screen fabrics enhance the architectural design of buildings by harmoniously diffusing daylight. 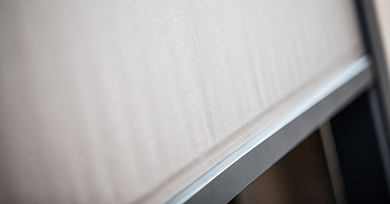 As the fabrics are extremely fine, they require minimal boxing, helping conserve the building’s esthetic properties. Our light fabrics with a regular grain are available in a range of colors that match other fabrics in the collection for perfectly harmonious facades. 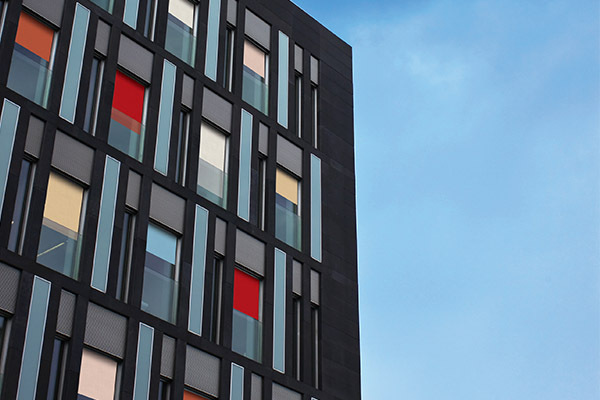 In addition to their technical performance, Dickson® screen fabrics add a unique esthetic appeal to your facades. Create buildings faithful your vision while protecting them from the sun thanks to the wide range of colors developed by the Design studio. The different openness factors offered by our ranges will also allow you to play with brightness levels. Mix colors to create a stylish and original facade. You can also combine ranges to suit your needs. Want to install a Dickson screen on the ground floor? We recommend Sunworker Open: its 15% openness factor allows enough light into your room while protecting you from the sun. For greater privacy, choose Sunworker Opaque. Its 0% openness factor shields you from prying eyes.